Linux is a powerful and diverse operating system, so naturally the screenshot tools for the platform are just as powerful and diverse. The wide variety of these screeenshot tools range from simple and easy-to-use to powerful command-line tools that offer the ability to script and automate the process. Ubuntu, like many GTK-based Linux distributions, comes with GNOME Screenshot as the default screen capture tool because it’s one the simplest and most straightforward screenshot tools available on Linux. GNOME Screenshot has the ability to take screenshots of your whole screen, specific windows and a manually selected rectangular regions. If you need additional time during capture you can add a delay to the full screen and window screenshots. GNOME Screenshot supports a few effects such as including the mouse cursor (pointer), adding a drop shadow, a border, or even a Vintage effect. The tool’s simplicity is a limitation with these effects though as most of them are only available when taking a screenshot of the current window. The manually selected region mode, for example, is unable to utilize any of the effects. How to Use It: If you don’t already have it, install GNOME Screenshot using your distribution’s package manager. Ubuntu, Ubuntu MATE, Ubuntu GNOME and many more users will already have GNOME Screenshot pre-installed. Then, launch the GNOME screenshot tool by searching for it in Ubuntu’s Dash or your distro’s applications menu. Taking a screenshot is simple: choose the type of screenshot you’d like (Whole Screen, Window, or Selectable Region), pick any options you want, and click the “Take Screenshot” button. From there, you can either save the image to your computer or copy it to your clipboard. GNOME Screenshot is typically the default screen capture tool for most distributions that ship with GTK-based desktop environements like GNOME, MATE, LXDE, Cinnamon, Budgie, Pantheon, and other environments. However, XFCE ships with their own tool called “Xfce4-screenshooter“. XFCE’s tool is practically identical to GNOME’s in terms of process, but XFCE’s opted for supporting the ZimageZ image host rather than image effects. Spectacle is the default screenshot utility for Kubuntu 16.04 and other KDE Plasma based distributions. Spectacle replaced KSnapshot as the official KDE screenshot tool starting with Plasma 5.5. Spectacle is a great combination of simplicity and powerful features. Spectacle offers all of the same features as GNOME Screenshot, minus effects, but has many additional features to set itself apart. Spectacle also provides all of these features without restricting any due to the mode used. Spectacle has the ability to capture your entire screen, a specific monitor, a particular window, a manually selected rectangular region, and even a specified dialog/popup window. All of these modes have the ability to include the mouse pointer and add a delay to the capture. Spectacle comes with great time savers such as automatic filename selection with customizable date format and the ability to remember the last manually selected region. Once a screenshot is captured you can save it to your computer, copy to your clipboard, open it directly in another application, or automatically upload it to either Imgur or Twitter. How to Use It: If you don’t have Spectacle, install it using your distribution’s package manager. Kubuntu, KDE Neon, and many more users will already have Spectacle pre-installed. Then, launch Spectacle from your App Menu, choose the type of screenshot you want, and click the “Take New Screenshot” button. Click “Export To” to save or upload the image, or copy it to your clipboard if you want to paste it elsewhere. Shutter is one of the most robust screenshot tools available for Linux and perhaps for any platform. Shutter includes the standards like full screen, specific windows, and manually selected regions but Shutter goes above and beyond the features of a standard screen capture tool. 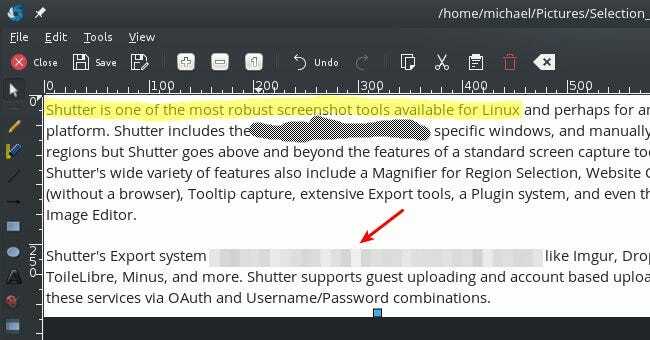 Shutter’s wide variety of features also include a Magnifier for Region Selection, Website Capture (without a browser), Tooltip capture, extensive Export tools, a Plugin system, and even their own Image Editor. Shutter’s Export system supports custom FTP servers and Cloud services like Imgur, Dropbox, ToileLibre, Minus, and more. Shutter supports guest uploading and account based uploading to these services via OAuth or Username/Password combinations. Shutter’s Plugin system provides an impressive set of effects and tools that can be automatically applied to any image loaded in the session. Shutter’s Effects and Tools include Sepia coloring, Greyscaling, Watermarking, “Torn Paper”, Auto-Resizing, Auto-Cropping, and many more. Shutter’s built-in Image Editor provides a wide array of fundamental features like adding text and cropping. The editor’s most interesting features though are the ability to highlight elements with Arrows, Drawing Shapes and, of course, a Highlighter. However on occasion you may want to share a screenshot but restrict some of the data from view. Shutter provides this functionality with a Censorship Brush tool and a Pixelation tool to keep that data from prying eyes. The editor also comes with an auto-increment shape tool that can be added to screenshots making Shutter the perfect capture tool for step-by-step guides. How to Use It: To use Shutter, download and install it from their home page, or your distro’s package manager, if it has it. Then, just launch it from your distribution’s app menu, choose the type of screenshot you want to take, and press “Enter” to finish the capture. When you’re done, you’ll have a lot of choices in terms of what to do with the resulting screenshot. For power-users command-line functionality can be very important, that’s where scrot and maim come in. The majority of features provided by the GUI (Graphical User Interface) applications are available in both scrot and maim but can also use either tool for automated screenshots, screenshots of remote computers over SSH and many other features. scrot is the more all-in-one tool for command line screenshots, as it provides options for adding a delay, quality control, region selection, thumbnail generation and much more. Alternatively, maim takes a more simplistic approach by relying on other tools to improve functionality. For example with maim, if you want take a screenshot of the active window then you’ll need to incorporate the use of “xdotool“. Both of these applications are great for taking screenshots on the command line but you’ll need to decide which approach is best for you. How to Use Them: scrot and maim are more complex than we could dive into here, but the basics are simple. Install scrot or maim from your distribution’s repository, and run scrot filename.jpg or maim filename.jpg to take a screenshot. Read through the manpage of each command for more details on the stuff you can do–for example, you can set them to use the current date for the file name, or change where the screenshots are saved.